It’s easier than you think with the Improve Karate Hypnosis MP3. Steve G. Jones, Ed.D., Clinical Hypnotherapist, charges $1,500 for a custom recording and $25,000 for a one-hour private hypnotherapy session at his office. But you can get all the benefits for this low price. Simply listen to the Improve Karate Hypnosis MP3 session every night as you go to bed for three weeks and feel the changes happening in your life. You will feel more empowered, more in touch with your true self, and you will truly know that your goals are within your reach. Steve G. Jones achieves AMAZING and LASTING results!!! Hypnosis is the easiest way to affect change in your life because the positive messages go straight to your subconscious mind effortlessly so you can accomplish your goals and reach for the stars!! All you have to do is listen to the Improve Karate Hypnosis MP3 download at night as you go to sleep!!! You’ll hear soft music, the gentle sounds of the beach, and the soothing sound of Steve G. Jones’ voice all working together to bring about positive changes in your life easily and naturally. Steve G. Jones has been helping people improve their lives with hypnosis for over 17 years…now it’s time for him to help YOU… don’t wait, do it NOW !!! you’ll be glad you did. See you at the top! And as you continue relaxing deeper, deeper, and more deeply relaxed, I would like you to imagine yourself now in the dojo. You have bowed in and you are so relaxed and confident. You take a deep breath in…hold it…open your mouth and exhale very slowly…good. And then another deep breath in, this time inhaling confidence and relaxation…and hold it…open your mouth slightly and exhale any fear, any anxiety, just let it go. You are so relaxed now. I would like you now to imagine yourself running a kata, any kata, it is your choice, but imagine forming it perfectly. You realize that perfect practice makes perfect. As you imagine running your kata now, you imagine running it perfectly. Everything is so easy for you and you realize by doing this exercise in your mind, it will translate into actual improved performance so you always imagine yourself running your katas perfectly every time. And now you imagine finishing the kata if you aren’t already finished, that’s right. I would like you to imagine yourself sparring with an opponent. Notice how focused you are. You are always focused, especially when you are sparring. You are paying careful attention to your opponent at all times, watching their every move. You always keep your eyes on your opponent and you are very focused. And now as you imagine yourself kicking and punching your opponent notice your speed. Your speed will improve day by day but notice how quickly you’re able to use techniques in your mind. You always imagine performing your techniques perfectly and with the utmost speed. And by imagining this you will have increased speed and you actually do spar with an opponent. Notice how confident you are because you have taken the time to practice. You have taken the time to prepare properly. So you are very confident. I would like you now to imagine yourself in class with other students just practicing your techniques. Notice how confident you are and how focused you are and how determined you are to properly execute each technique. You are so relaxed, determined and focused at all times. Your techniques are perfect and you are always open to learning new techniques so you are willing to put in the extra time to master new techniques and as you progress on your way in karate, things come much more easily for you. You are able to learn techniques more easily and rapidly and deeply. It’s as if you and the art of karate are one. You are able to learn all techniques and properly apply all the techniques easily. These techniques seem natural to you, that’s right, a natural extension of you. You’re able to easily express yourself in karate. You are able to easily and naturally while sparring. You imagine yourself to be like water. You are able to conform to what your opponent is doing and to offer the proper defense and the proper attack based on your opponent. When in a cup, water is a cup. When in a bucket, water is a bucket. When you are sparring a particular opponent, you match what that opponent needs so that you are able to easily defeat that opponent. You are like water. Always able to change, to match each opponent, and win. You are relaxed at all times, so relaxed and focused at all times. So relax now and realize that your karate abilities are improving day by day easily and naturally because you are dedicated to improvement. Karate is more than just a sport. Karate involves skill, practice, focus, and patience. This powerful hypnosis recording will allow you develop the many important skills associated with Karate. 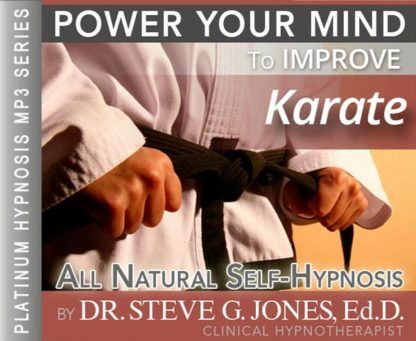 Hypnotherapy allows you to visualize your Karate skills and techniques so that you are able to master them first in your mind, and then with your physical body. Karate was developed in the Ryukyu Islands. These islands are located south of the mainland of Japan in the East China Sea. Karate uses striking as is its main form of contact including kicking and punching. Karate also consists of striking techniques using the hands, elbows, and knees. Karate is a skill that takes years to master. Luckily, hypnotherapy can help you along your quest to be a karate master, or in other words a karateka. We suggest you listen to the Improve Karate Hypnosis MP3 recording for 21 nights before going to bed each night in order for the powerful suggestions to start working in your subconscious mind. Also, for this recording, we suggest you listen to the hypnosis session on a weekly or bi-monthly basis after you have listened to it for the initial 21 nights, to continue to let the hypnosis suggestions work as you progress through your karate program.